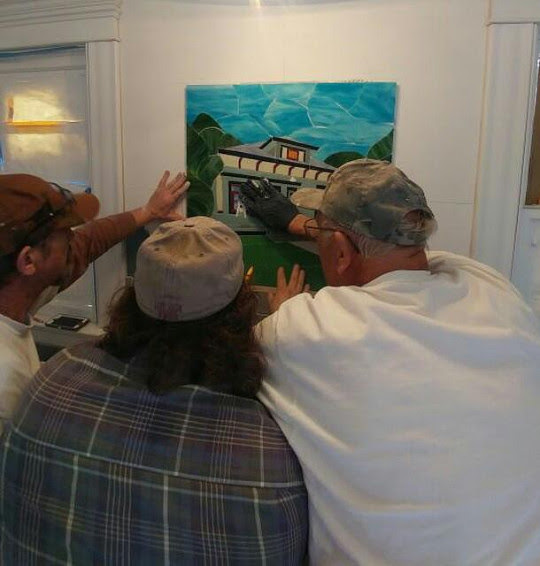 In California, three men adhere my first back splash onto the wall of a historic home. The project was daunting and while I did most of the work, it was Margaret who researched how I was to do the work and who was with me as I proceeded into learning the steps. Self doubt tries to win when we are faced with a daunting opportunity. Hugh Siler, the man on the left had such faith in my talents, that he entrusted me to create the backsplash. When he says that he didn’t know who else he would have wanted to make it, I want to hide my head in the sand and then cry out… Surely anyone but me. But when I see what emerged, I am grateful to those who encourage me. 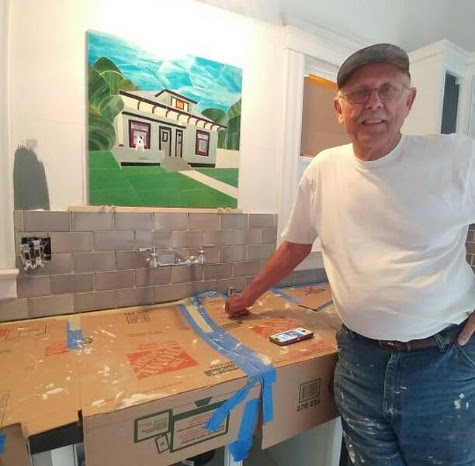 Bernie the Tile Guy: Master of his craft in business for 40 years. There was this moment late in the process when I needed to flip the mosaic over. My negative prediction was that the tiny pieces, especially T-Bone, the puppy dog, would plummet to the ground. But they stayed glued to the mesh. After the flip, I cut through the mesh to turn what had been a unified mosaic containing 200+ pieces of glass into seven pieces. We shipped it quickly the next day to get those seven pieces to Orange CA to match up with when Hugh’s tile guy was in town. Bernie has been doing masonry and tile work for 45 years. Knowing an experienced set of hands would take care of the mosaic once it arrived in CA, was a stress reducer. Hugh is doing amazing work and just the other day he sent me a link. The National Trust of Historic Preservation had done a story on him. 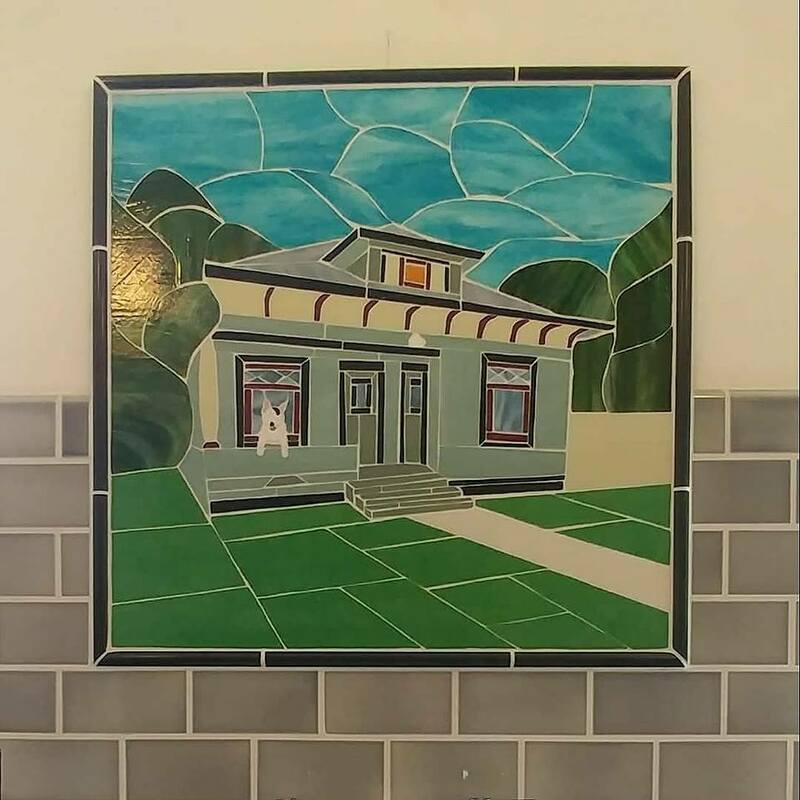 Having seen Hugh’s work in person last August, I can tell you there is plenty to highlight from his restored homes, but there in the midst of the article is the (my) backsplash. Nutmeg Designs House Portrait Backsplash for a historic 1905 California home. Photo by Hugh Siler.